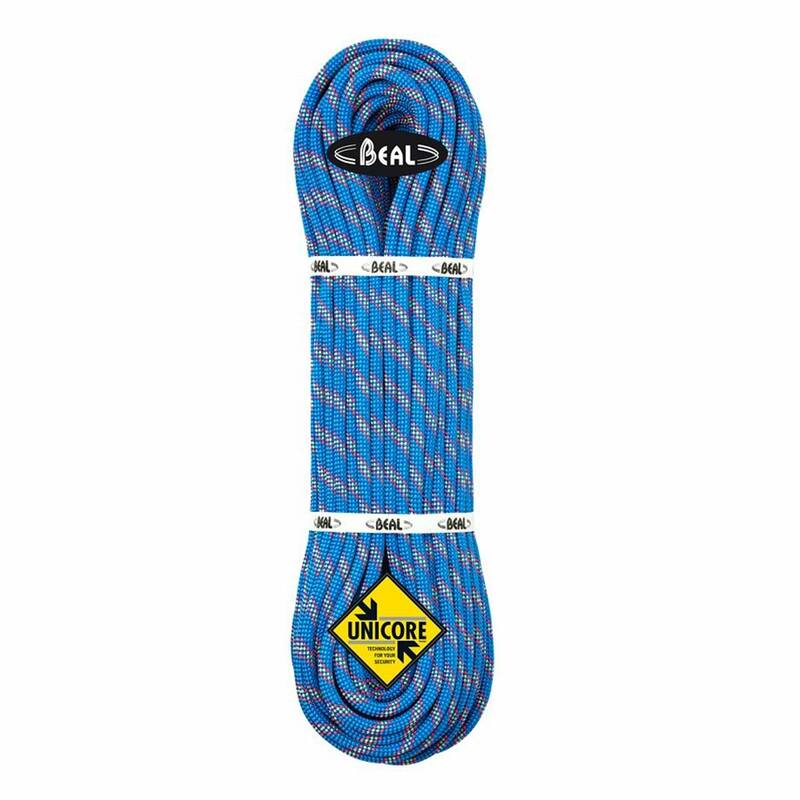 The Beal Booster III climbing rope is the pioneer of thin, dedicated single ropes for experienced climbers who need to be fast and light in the mountains. The Beal Booster III is ultra-light (just 63g/m) and provides excellent strength and easy running. A 7-fall rating ensures peace of mind during heavy use. The Beal Dry Cover sheath coating improves rope-running through carabiners and helps stop water absorption and freezing on alpine climbs and enhances durability for extended use. Dry Cover is Beal's weather-resistant treatment that protects the sheath of the rope from dust, dirt, ice and water. It also improves the rope's handling and longevity. Beal PPE may be left for up to five years in good storage conditions before the first use without affecting the duration of its future use. All Beal ropes have their manufacturing year labelled on the product name. If you want to know the date of manufacture of a rope, just ask an EpicTV Gear Geek on chat. All ropes have a date of manufacture printed on them. If you'd like to know the date of manufacture of a specific rope, feel free to talk to a Gear Geek via the chat window. Handled amazingly well from the first use! Rope feels slim and is surprisingly light for a 70m rope. Highly recommended! This rope is a great choice for sport climbing, and especially good for multi-pitch climbing thanks to length (80 m) and low weight. Superb price to value ratio. The rope just have been used for sport climbing on limestone and about 70% of the climbing is leaded, the rest is top rope. Briefly these are the circumstances of usage, now let’s see the experiences. The length of the rope (80 meter) is very useful by multi-pitch climbing, you can gain extra time by reduced number of needed belay stations. However the super length can be cumbersome by short sport climbs. Another disadvantage of this length that it is hard to avoid the twist of the rope. The diameter (9.7 mm) is perfect to handle in belay plates such as in assisted braking devices. But I noticed a strange property that the cross section of the rope is not circular rather an ellipsoid, especially at the middle third of the length. Still this shape is not caused any vagueness or discomfort by handling. This phenomenon may be occured by the “Unicore” manufacturing technology. Thanks to the “Dry cover” surface treatment the sheath resists really well to dirt and humidity. I often use it in dusty environment without rope bag, but seems still like it was newly unpacked. By the way, the blue base colour with cyklamen-grey coloured pattern is a very good combination, it has a good visibility also at twilight. The sheath treatment also gives a smooth handling, however the wear resistance is exceptionable. The fact is that the last 5 meter of the rope started to be fuzzy after a few climb. The rope has quite low impact force, therefore the falls are really smooth, but the higher dynamic elongation need to be considered in every risky case. As yet I am satisfied with the dynamic properties. Low impact force, good handling and great durability. Been using it for almost a year now, mostly trad climbing, and can't complain about anything. This rope is perfect for sport climbing. It feels very light and fluid and in my opinion this diameter (9.7mm) is a good compromise between durability and performance: I use it while working a route as well as sending it! I have seen it perform in the soaking wet in North Wales, right through to the super sharp limestone of San Vito Lo Cappo in Sicilly and it has exceled at evrything iv thrown at it. Great rope for all kind of actions. The price as well as the rope was great. Nice quality price ratio. Good all round rope... Excellent for tope roping and repointing. Feels sturdy and handles really well. However not as dynamic as a triple rated rope which is to be expected. At the tope of 40m routes you do feel the drag! The best price I could find was here on Epictv.com. Excellent rope and a very fast delivery.